Priced $200. under current eBay Buy-It-Now! Save! Click below for full details and to order. Only one available! Digger, Claw, and Crane games are perhaps the most classic arcade devices of all time. They originated as a penny candy vendor in 1896 and they have survived to the present day in many adaptations of style, designs and play method. They have over 100 years of rich and interesting history. They are fascinating to play, and it is fun to “See it Operate”. 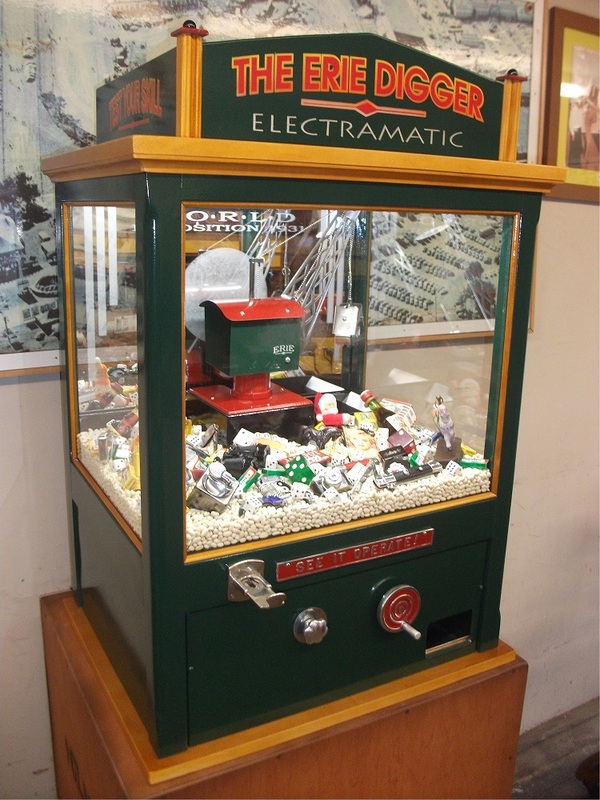 Despite the fact that in the 1930’s diggers were by far the most popular category of coin-operated games they are now becoming increasingly hard to find, and they are conspicuously absent from many collections. My work as a Restoration Artist is devoted exclusively to antique digger games. I offer a limited number of restored, high-quality, investment diggers from my collection each year to discriminating buyers. You may wish to review my Picture Gallery. There you will find images (and information) of a wide variety of diggers which I have restored during past years. If you view a machine you admire, visit the section Acquiring a Restored Digger, and feel free to contact me regarding availability from my studio.